My son and I have been busy making <a href="http://www.inhabitots.com/5-unique-ways-to-decorate-your-pumpkin-no-carving-necessary/">last-minute Halloween decorations</a>. 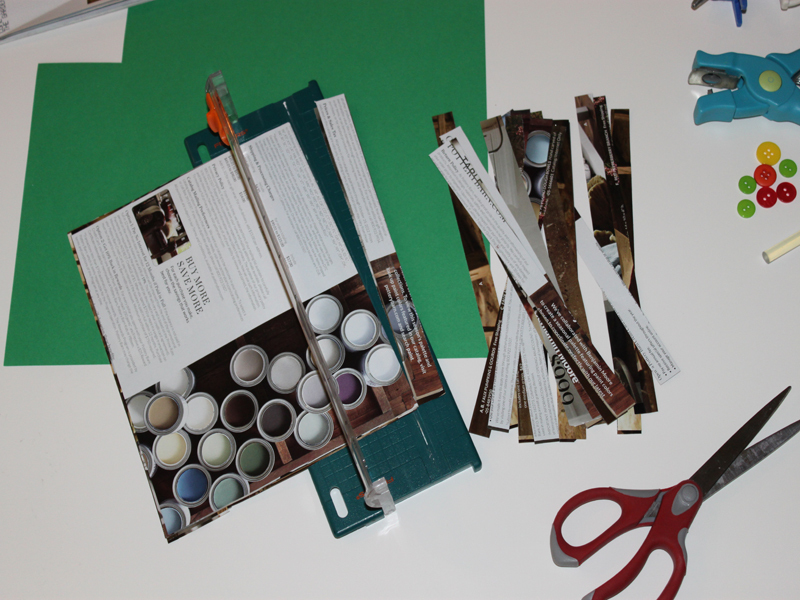 We wanted to make a set of <a href="http://www.inhabitots.com/how-to-find-the-best-organic-pumpkin-for-halloween/">pumpkins</a> for our dining room table by using recycled books. However, when we started working on the project, my son pointed out that we have an excess amount of magazines in the recycling bin and that these would be a better option! 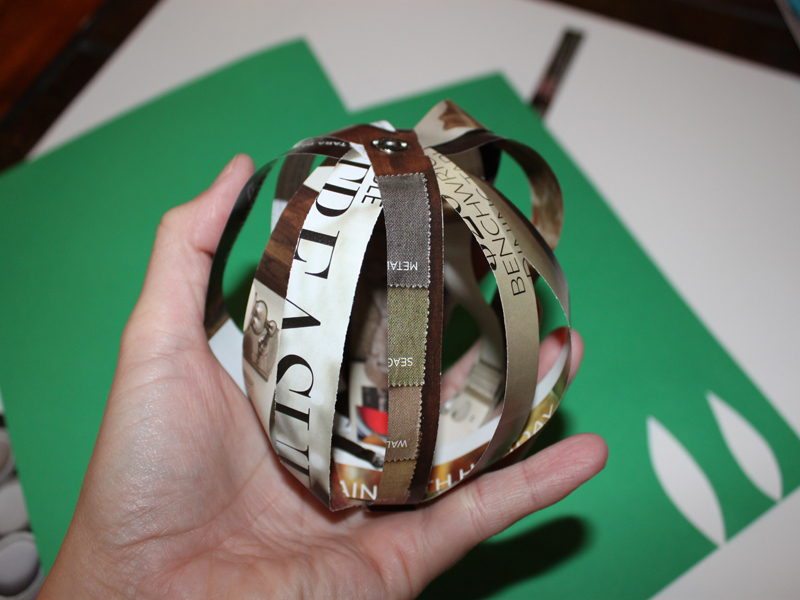 We went to work cutting, gluing and shaping miniature pumpkins from strips of <a href="http://www.inhabitots.com/how-to-make-a-diy-recycled-paper-bowl/">magazine paper</a>. 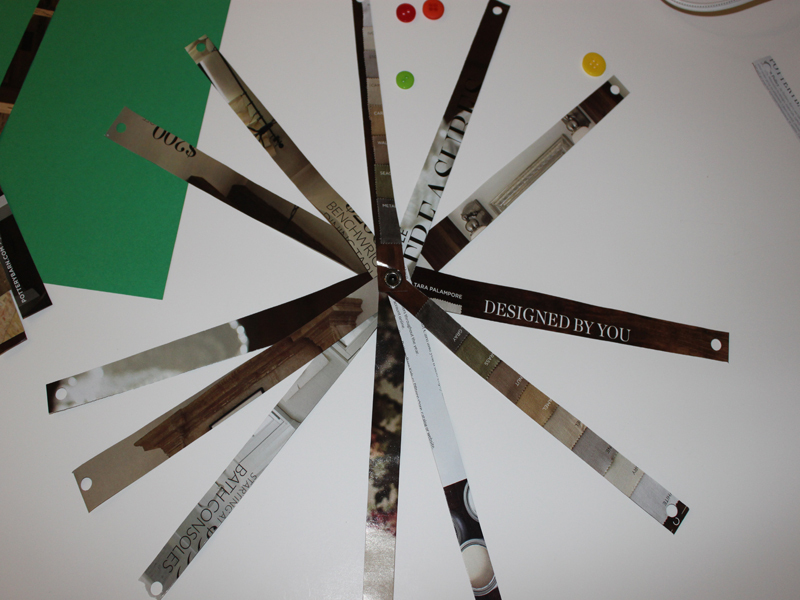 We were thrilled with the results and we were able to make a dozen of them in no time. At first we used glue and buttons to hold the pumpkins together. Then, we realized that by using brads to secure the pumpkins, we were able to make them much faster. Read on to learn how to make you own pumpkins from magazine pages to add to your holiday table or Halloween party this fall. 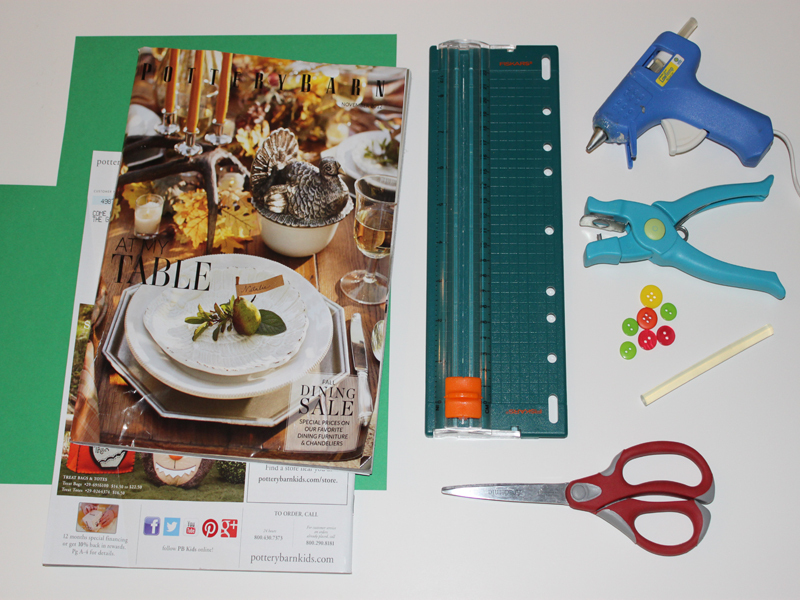 <h2><!--more--></h2> <h2>Step 1: Cut the Pumpkin Strips</h2> Using either scissors or a paper cutter cut 14 strips of paper that are approximately 1 inch wide by 8 inches long. 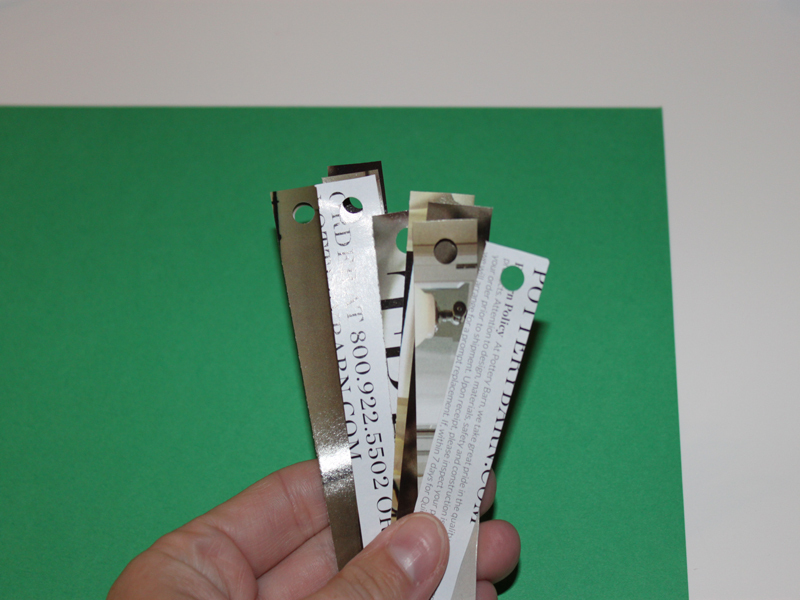 <h2>Step 2: Get Punching</h2> Using a hole punch, punch a hole on either end of each of the strips of paper. 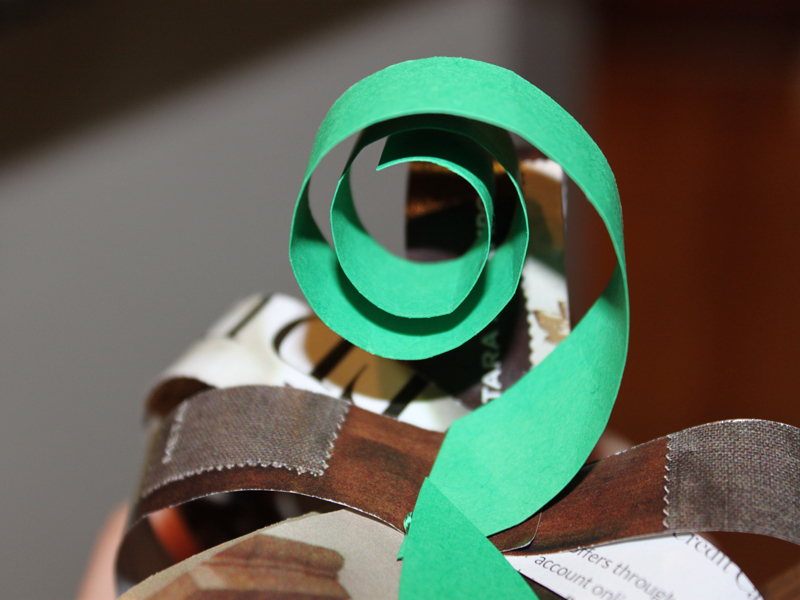 <h2>Step 4: Fan It Out</h2> Fan all of the strips out.You can decide to add more pieces of paper at this time. 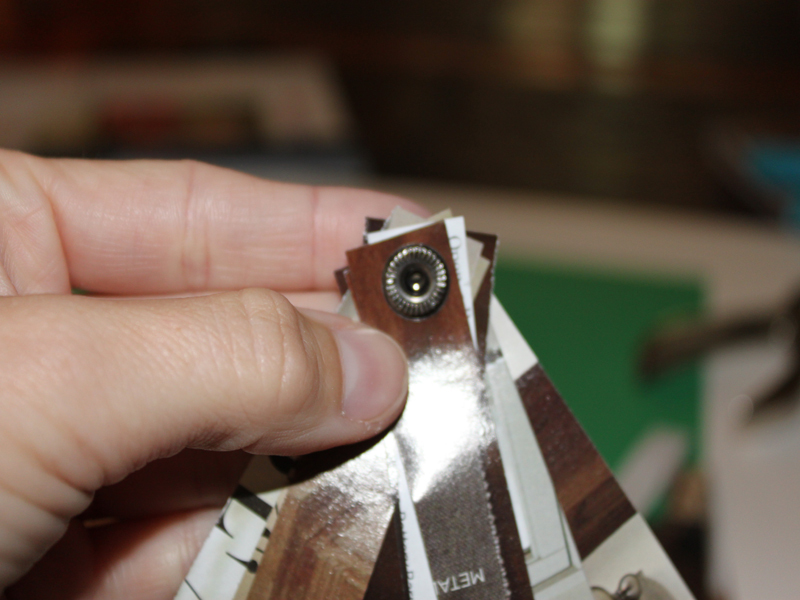 <h2>Step 3: Secure It</h2> Secure one end of all of the paper strips with a brad. <h2>Step 5: Round It Out</h2> Slowly secure each of the remainder ends with another brad, until you have a ball shape. You can add more pieces of paper if you want the pumpkins to be fuller - we chose to keep ours the way they turned out because they will look great hanging from our chandelier with the light coming through. 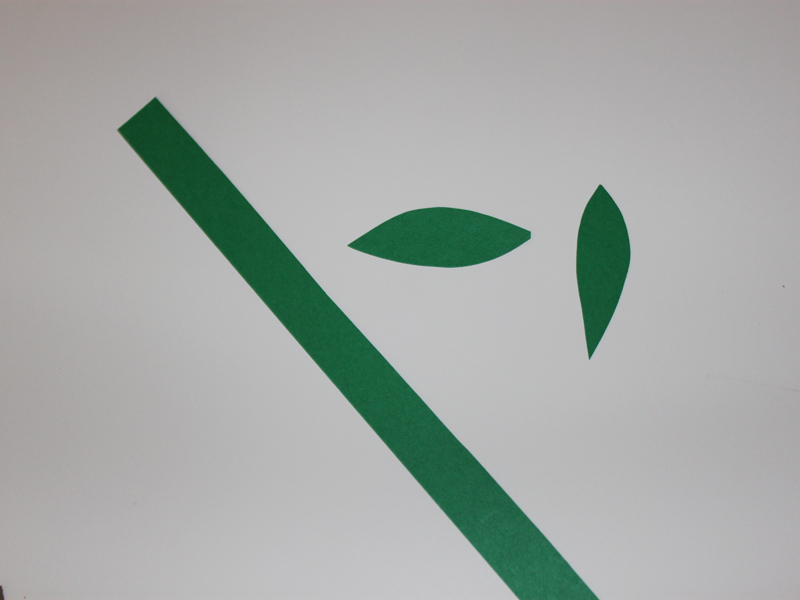 <h2>Step 6: Cut the Stem and Leaves</h2> Using leftover green paper or paper from the recycling bin, cut a long strip of paper for the stem and a couple of small leaves. 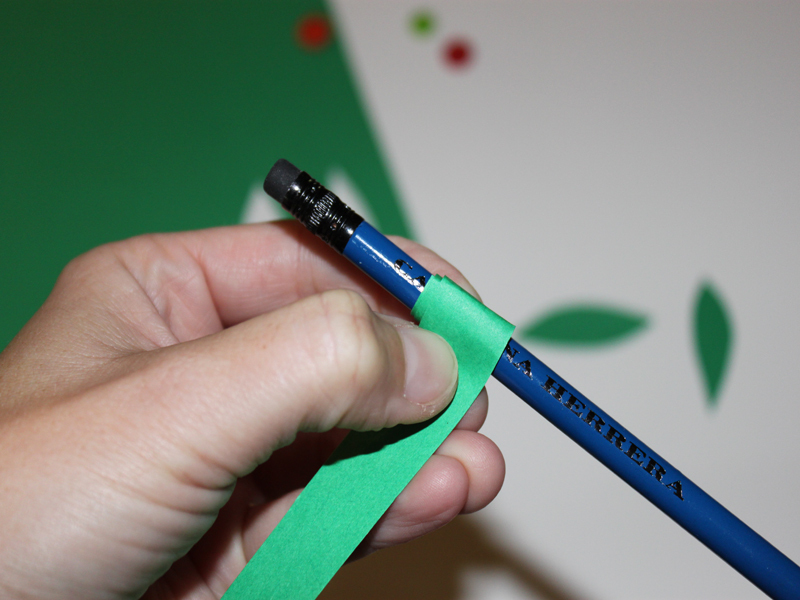 <h2>Step 7: Roll the Stem</h2> Roll the long strip of green paper around a pencil until a small spiral of paper is formed. <h2>Step 8: Glue It Together</h2> Add the stem and leaves to the top of the pumpkin with glue, allow to dry and then place around your home for fun decorations made by your children. <h2>Step 9: Decorate!</h2> Let your children use these simple little pumpkins to <a href="http://www.inhabitots.com/how-to-create-a-simple-nature-table-bring-the-magic-of-autumn-into-your-home/">decorate your holiday table</a> or mantle! My son and I have been busy making last-minute Halloween decorations. 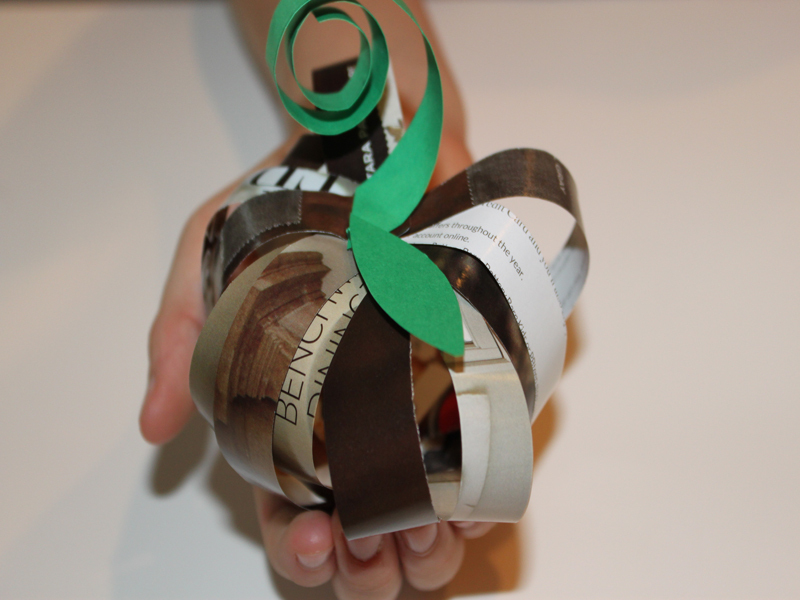 We wanted to make a set of pumpkins for our dining room table by using recycled books. However, when we started working on the project, my son pointed out that we have an excess amount of magazines in the recycling bin and that these would be a better option! 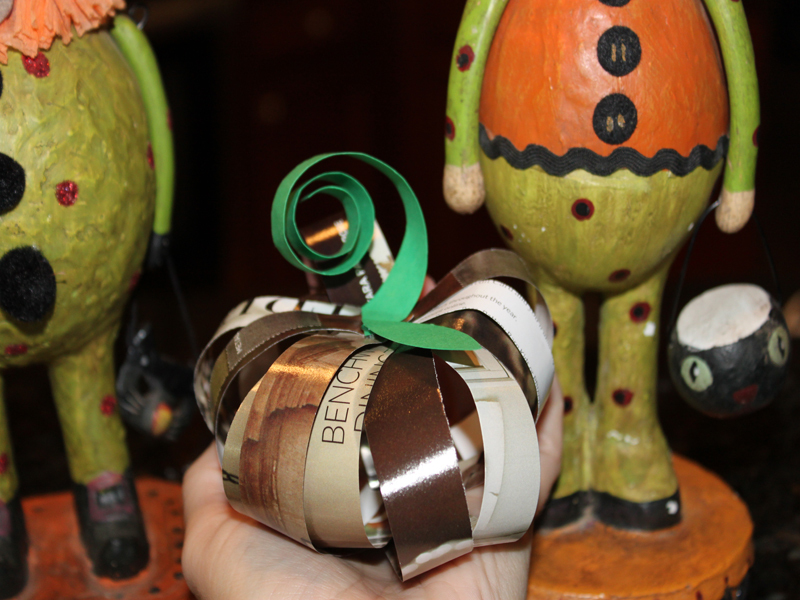 We went to work cutting, gluing and shaping miniature pumpkins from strips of magazine paper. We were thrilled with the results and we were able to make a dozen of them in no time. At first we used glue and buttons to hold the pumpkins together. Then, we realized that by using brads to secure the pumpkins, we were able to make them much faster. Read on to learn how to make you own pumpkins from magazine pages to add to your holiday table or Halloween party this fall.